We all love surprise gifts at the end of the year and #WWTBAM wants you to surprise someone who you believe deserves to be surprised. Blow someone’s mind with a huge surprise this holiday season. To Nominate that special person you think deserves to be a millionaire. The special person can be your mother, father, sibling, friend, school teacher, colleague, mentor or anyone who has played significant roles in your life. 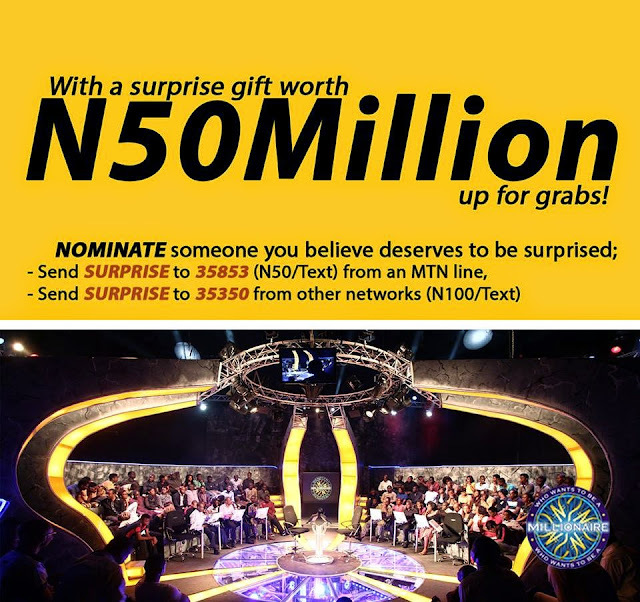 Simply SEND SURPRISE to 35853 (MTN line) or 35350 (Other networks) to get them on the Hot seat, playing with the help of a Quiz-master, to win N10M and a surprise gift worth N50M on the show.